Wanting some comfort food? 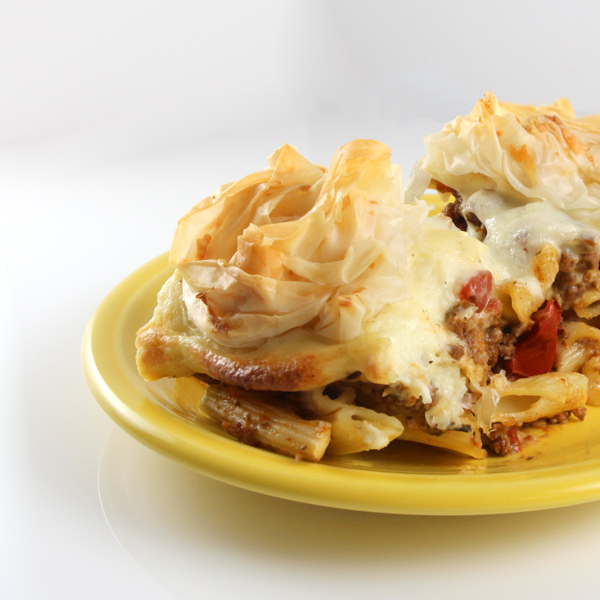 Look no further – this classic Greek baked pasta dish is a packed with flavor and topped with crispy layers of phyllo dough. Thaw one roll of phyllo, following thawing instructions on package. Preheat oven to 350ºF. Cook pasta al dente according to package instructions. Drain and toss with 3 tablespoons melted butter and 1 cup parmesan cheese. Spread pasta mixture into a buttered 9 x 13” baking dish. In a large skillet over medium heat, cook beef for 8-10 minutes or until meat is no longer pink, breaking it apart as it cooks. Drain. Stir in pasta sauce, garlic, ½ teaspoon salt, cinnamon. Cook for another 8-10 minutes stirring occasionally as it thickens. Spoon meat sauce over pasta. In a large saucepan over medium heat, melt 1 stick of butter. Whisk in flour, ½ teaspoon salt and pepper cooking for 1-2 minutes. Gradually add in milk. Bring to a low boil, then reduce to low heat whisking 2-3 minutes or until thickened. Let cool for 10 minutes and mix in ½ cup parmesan and eggs. Spread on top of meat sauce. Bake for 20 minutes. While dish is baking, unroll and cover phyllo sheets with plastic wrap, then a slightly damp towel to prevent drying out. Lay one sheet of phyllo on work surface. Lightly brush with melted butter and sprinkle a little parmesan. Using both hands, scrunch phyllo sheet into a loose ball about 3” in diameter. Repeat with remaining sheets of phyllo. Remove baking dish from oven. Place the phyllo balls evenly across the top of sauce in 4 rows of 5. 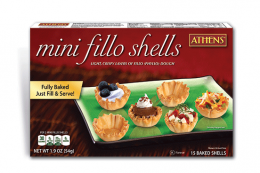 Brush phyllo with any remaining butter. Continue baking for 25-30 minutes or until phyllo is golden brown. It is important not to overcook pasta as it will continue cooking in the oven and boiling too long will cause it to be “gummy”. This brown sauce incorporates Madeira wine and goes great with our Veal Tenderloin in Phyllo. This decadent dessert featuring alternating layers of chocolate cream and flaky Phyllo is sure to capture the attention of the sweet-toothed among your gathering’s attendees.